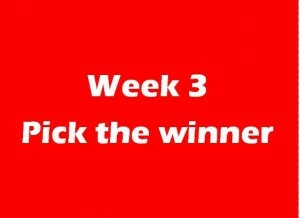 Fans can make their picks on which teams will win Week 3 high school football games. Voting will remain open until 5 p.m. Thursday. To vote on below games click here. Eastlake vs. Union, 4:30 p.m.
Battle Ground vs. Mountain View, 7:30 p.m.
Mount Si vs. Skyview, 7 p.m.
R.A. Long vs. Hockinson, 7 p.m.
Columbia River vs. Ridgefield, 7 p.m.
Woodland at Washougal, 7 p.m.
Heritage vs. Kelso, 7 p.m.
Camas vs. West Valley-Yakima, 7 p.m.
Black Hills vs. Prairie, 7 p.m.
Fort Vancouver vs. Mark Morris, 7 p.m.
Hudson’s Bay vs. WF West, 7 p.m.
Evergreen vs. Lakewood, 7 p.m.
La Center vs. Hoquiam, 7 p.m.
Columbia-White Salmon at Montesano, 7 p.m.
Bellevue Christian vs. King’s Way Christian, 6 p.m.
Tenino vs. Castle Rock, 7 p.m.
Riverside (Ore.) vs. Seton Catholic, 1 p.m.